Bordered by the York River and Mobjack Bay, Gloucester County, Virginia, is steeped in history and adorned with natural beauty. With York, Hampton, and Newport News across the river to the south, and Richmond just an hour to the west, our community has a small-town feel along with access to all the conveniences of city life. With good schools and a population under 40,000, Gloucester County is a great place to raise a family. That’s why our personal injury law firm is located here! As a law firm with deep roots in our community, we never want people here to get hurt. In fact, we wouldn’t mind going out of business if it meant people were staying safe. But when things do go wrong, we stand ready to help our neighbors. As U.S. Marine veterans, the attorneys at GibsonSingleton Virginia Injury Attorneys strongly believe in brotherhood, teamwork, and leaving no person behind. That’s why we chose the field of law we did: personal injury. We understand that anyone can be hit by hard times through no fault of their own, and we want to protect them from further harm. As Virginia personal injury attorneys, we seek to help you through your difficult time and get you back on your feet. If you have been injured and are facing overwhelming medical bills and loss of income, we will work to get you compensation for your present and future losses by filing a personal injury claim. To find out more about your legal rights and options, call our office for a free consultation - (804) 413-6777. We have a "no-fee guarantee," meaning that we get paid when you get paid. Gloucester County’s history goes back to the earliest days of the European settlement of the United States. Our county is where the Native American village of Werowocomoco once stood. 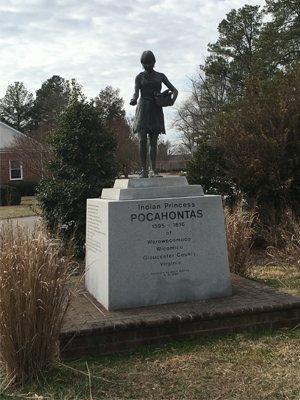 If you’re not familiar with that site, it was the birthplace of Pocahontas and where, according to legend, she laid her head over the head of Captain John Smith to save his life. Our county is also home to the Rosewell ruins, the brick remains of the once-grand Rosewell Mansion, which was first constructed in 1725. The birth of our nation also has roots in this county. The Revolutionary War Battle of the Hook was fought here in 1781. Some skirmishes could have occurred right in front of our office. This engagement was important because it cut off General Cornwallis' supply line and prevented his escape, leading to his surrender at Yorktown. Periodically, thousands of participants engage in reenactments of the Battle of the Hook, and Cornwallis’ surrender at Yorktown. Located on Virginia’s Middle Peninsula, Gloucester County has approximately 500 miles of tidal shoreline, including scenic inlets, beaches, and marinas. Its proximity to so many rivers and the Chesapeake Bay make our county ideal for all types of water activities, including sailing, boating, canoeing, kayaking, hunting, swimming, and fishing. Our inland area has its charms too, with nature trails, a lake, campgrounds, a golf course, and lush parks. Throughout the year, Gloucester County has activities for people of all ages. There’s history, music, festivals, tours, entertainment, parades, and more. If music is your thing, our county has "Symphony Under the Stars," "Concerts on the Green," and "Blues ‘n Brews," just to name a few. In fact, our attorney Ken Gibson is a member of The Ballast Band, a local group that mixes rock n’ roll with a blues and funk, and often participates in local charity events. Other county-wide celebrations include our annual Daffodil Festival, the Chamber Wine Festival at Brent and Becky’s Bulbs, the Ruritan Seafood festival, Gloucester Arts on Main’s festival, the Main St. Renaissance festival, Comic-Con at our public library, and so much more. Whether you’re just visiting or making a home here to take advantage of the many fine schools and churches, Gloucester County has plenty of excellent restaurants, places to stay, and places to shop. If you’re ever injured in Gloucester County, that’s where we come in. While Gloucester County is a wonderful place to visit and live, it’s not without hazards. In 2015, 436 crashes took place on Gloucester roads - that’s more than one every day! Of these wrecks, more than half cause injury or death. Speeding and alcohol are often factors. When someone is negligent and people get hurt, GibsonSingleton Virginia Injury Attorneys can handle most injury claims, including truck crashes, motorcycle collisions, car accidents, boating accidents, bicycle and pedestrian accidents, medical malpractice, slip and falls, nursing home neglect and abuse, dog bites, and more. Sadly, an accident can happen anywhere, any time. You can be on vacation, commuting to or from work, or just stepping out onto your front porch when your life takes an unfortunate turn. Don’t let an injury to you or a family member jeopardize the security of your future. Our legal team is passionate about getting compensation for victims who have suffered injury due to the careless, negligent, or willful acts of another person or company. We fight to get you compensation for present and future medical bills, pain and suffering, lost wages, permanent injury, and more. Just call (804) 413-6777 to speak to an attorney and get a free case evaluation. At GibsonSingleton Virginia Injury Attorneys, we take the Marine motto, "Semper Fidelis" (Always Faithful), to heart. We will always be faithful to our clients. Check out our "no fee guarantee" - we get paid when you get paid. In serving you, we always seek to protect your interests by fighting smarter, not just harder. Instead of simply battling insurance companies, we research, plan, and present compelling evidence of your injuries. If your case goes to trial, we’re ready. We know Gloucester County, from the natural scenery to the local courtrooms. We don’t want you to get hurt. But if you do, call us. Helping our neighbors is our calling.